The label for Tröegs Mad Dreams. Head to Brickwall Tavern in Center City today to celebrate Christmas in July. On tap is Tröegs Mad Elf, an 11-percent, ruby-red creation that tastes of chocolate malt, cherries, honey and peppercorn. Ten-ounce pours will be available for $6, while supplies last. Mad Elf fans usually need to wait until fall or winter to find the brew in bars or on shelves. Brickwall will also serve two special Mad Elf blends. 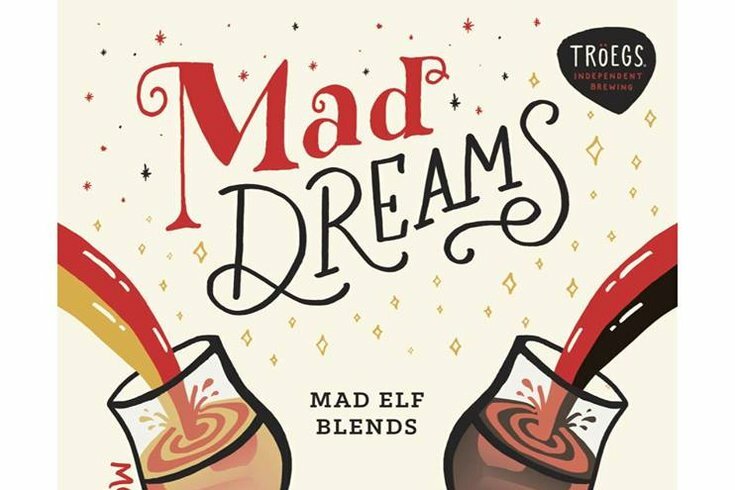 Mad Dreams is 30-percent Mad Elf and 70-percent DreamWeaver Wheat. Chocolate Elf is half Mad Elf and half Nitro Chocolate Stout. At 4 p.m., a DJ will start spinning tunes at the bar in anticipation for tonight's Center City Sips crowds.